This was a ton of fun. I was expecting a poor quality knockoff of Gremlins but like you said Dave this was well done! Kevin: Thanks for the comment! And I couldn't agree with you more on CRITTERS! I've enjoyed it for years. This is another blast from the past, Loved this movie and the transformation scene with the bounty hunter on the spaceship blew me away as a kid. Also the size the critters grew to. Barl3y: Thanks for the comment! 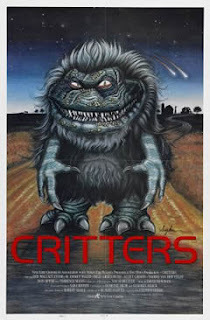 The transformation scene was very impressive, as were the critters themselves. Haven't seen ATTACK THE BLOCK, but now I have to check that out!